What could have resulted in a tragedy, turned out well for the occupants of an experimental aircraft. At around 12:30pm Saturday afternoon Daniel Plett and his wife Charlene, were out for a pleasure flight in their experimental aircraft, when they caught a cross wind coming in for a landing. The aircraft was forced of the runway and came in for a hard landing. 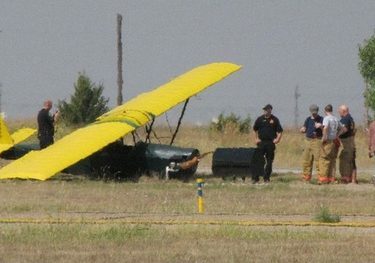 Both Plett and his wife walked away from the aircraft, suffering no injuries. The plane however sustained some damage. Emergency personnel from the City, County, and Highway Patrol responded to the incident.